Campeggio La Paille Haute si trova a Boiry-Notre-Dame, Passo di Calais. Il campeggio a terrazze dispone di piazzole delimitate, senza ombra e piazzole poco ombreggiate. È possibile affittare casemobili. Il campeggio dispone di un parco giochi e di un parco giochi al coperto. Per chi desidera rilassarsi dopo una giornata intensa ci sono sauna e idromassaggio. Il campeggio dispone di una piscina scoperta e una vasca per i più piccoli. Non è sempre necessario cucinare, perché all’interno del campeggio ci sono snackbar, pizzeria, ristorante selfservice e ristorante con menù poche portate presente. In campeggio è possibile acquistare pane fresco. Potete navigare su Internet, poiché il campeggio dispone di uno o più computer con collegamento a Internet e c'è un punto wi-fi. Ogni anno un ispettore visita il Campeggio La Paille Haute, controllando oltre 200 tra attrezzature e altri punti di interesse del campeggio. L'ispettore è un dipendente ACSI e non lavora per il campeggio. We stayed here for 3 nights and focussed on WW1 battlefields and cemeteries - it is in a very handy location for the Somme and Arras. It seems that a lot of people use this site for night stops going north or south, and the turnover was certainly very high. However, we enjoyed our stay, had a good meal in the restaurant, and would certainly use the site again. The only problem is that pitches are not marked out, you just go where you want. This means that some people take up more than their share of room by parking awkwardly. We were here at a peak time, and there were people wandering round seeing if they could squeeze in here and there - no pleasant if someone squeezes in beside you! I have visited this site for the last nine years. In the roughly 47 years that I have been caravanning and camping through most of Western Europe I have never come across a 2 star site offering such good facilities and such a family- friendly atmosphere. You are assured of a warm and friendly welcome from the owners, Patricia and Fredric. The restaurant provides excellent value, honest to goodness meals, the 'poulet provencal' is particularly recommended. The site is well situated for those interested in the 1914 war and visiting the very impressive military cemetaries.Tthere are 2 good supermarkets within 5-10 minutes drive and a baker visits twice every morning. At 1 hour 30 minutes (using the motorway) from Calais this site makes a very convenient night halt. There are no amenities in the local village and during our visit at the end of May the site swimming pool, bar and restaurant were all closed. Stopped overnight and was pleasantly surprised. Good location and the site had a nice feel to it. The manager was very helpful and had a good sense of humour. Pitches were nice but the toilet facilities need some money spent on them. This site is in a great location for touring the WW1 monuments and sites. The village nearby is very quiet but does have a patisserie. The pool looked OK but couldn't judge as the weather was too cold to use it. Luckily with a motorhome, we are self-contained, because the toilets were pretty basic. They have a very scruffy "animal area" with unhappy looking animals which in my opinion needs to go. The restaurant is very pleasant and the guy who served us was great. The food however was atrocious, especially what passed as vegetables. Overcooked and cold. Very poor introduction to the first night of our French adventure. Our third visit to La Paille Haute. Stayed two nights this time and visited Cambrai. Site is convenient for ferries and tunnel. A first, we were crossing from Rotterdam and the short journey from Boiry Notre Dame was ideal to fit in with ferry times! Excellent site about 4 km from the motorway just north if Reims, so a a great stop over spot, very easy to get to in and out. Beautiful spot. Stayed four nights on the site, excellent for visits to WW1 sites. Also close to motorway, and good for overniht stop. Volete prenotare il Campeggio La Paille Haute o oppure saperne di più? Potete farlo usando i seguenti dati. Da Lille la A1 in direzione Parigi, uscita 15, quindi la D939 verso Cambrai. Dopo circa 3 km girare a sinistra per Boiry-Notre-Dame. Il campeggio è segnalato. 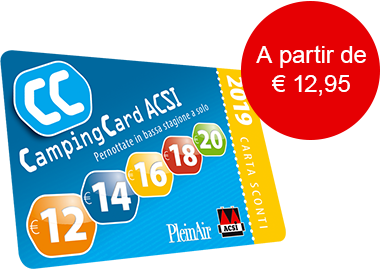 ACSI Eurocampings invia la tua richiesta di informazioni al "Campeggio La Paille Haute".